How many grant proposals does the Foundation review during a typical grant cycle and how many are usually chosen to receive grants? What is the largest grant amount the Foundation will consider? What is the process for making grant selections? If I am declined for a grant, may I reapply? If I receive a grant, when am I eligible to reapply? Am I limited to just one grant request? Does the organization have to be located in one of the four counties listed in Southeast Georgia? Do you consider grant requests for United Methodist organizations, agencies, etc. that are not located in the four counties listed in Southeast Georgia? Will the Foundation consider building or expansion projects for individual churches? Does the Foundation consider any types of grants to individual churches? How does the Foundation define Christian Education as it relates to the focus areas and funding interest? Do I need IRS 501(c)(3) recognized status before I can apply? Will your focus areas ever change? Will you consider non-US based international projects? How long will the Foundation be awarding grants? Does an organization have to be a member of the Georgia Center for Nonprofits in order to apply? Grant proposals are accepted at any time although most are received in the last 2 weeks of May and November just before the June 1 and December 1 deadlines. During a typical grant cycle we will receive about 40 proposals of which about 30 are selected to complete applications. We average about 12 grants per grant cycle. However, our decisions are based on the available budget and not a specific number of grants, therefore the number of grants chosen in a particular cycle will vary. We do not have a specific maximum grant amount although the available grant budget would determine the maximum amount available during a particular grant cycle. A typical annual grant making budget is about $1,400,000 of which about $200,000 is allocated to international grant making. Therefore, based on two grant cycles per year, each grant cycle will have a local grant making budget of about $600,000. Historically, grants made during an individual grant cycle have ranged from about $1,000 to about $400,000 and average about $50,000. Once an organization is selected to complete an application and submits the application, Foundation staff begins the process of analyzing and preparing the application for submittal to the board of directors. The analysis includes a review of the organization’s success relative to their mission, a review of the organization’s financial history for the previous two years and financial accountability as evidenced through an audit or financial review. Also included is a review of evidence supporting a qualified staff and responsible Board of Directors, goal-setting skills in place and a true need for the grant funds. And finally, the analysis typically includes a site visit which offers the Foundation an opportunity to view 1st hand the applicant’s program/project for which the grant would be used. The site visit also provides the applicant with an opportunity to showcase their work and provide supporting information that may not be included in the application package. Once the analyses are complete for all applications being considered in the cycle, a detailed summary of each application is provided to the board of directors. The board meets collectively for several days in mid-April for the Spring Grant Cycle and several days in mid-October for the Fall Grant Cycle. During these review meetings, board members discuss the application and the information provided in the detailed summaries and individually rate each proposal based on this information as it relates to eight points of criteria. 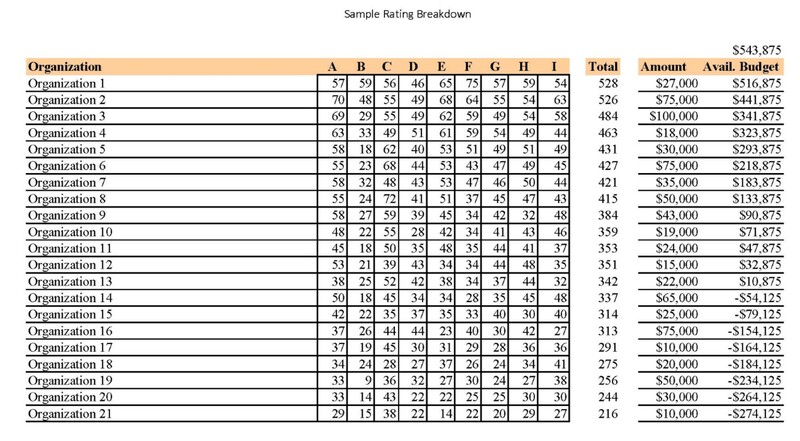 The ratings are tallied and used to rank each application in order of the rating from highest to lowest. The budget is then applied to the ranking to determine the initial applications that may be selected. The board then reviews the appropriateness of each amount requested and if special conditions apply such as partial, conditional or challenge grants. The final slate is approved during the full board meeting which is typically scheduled for the 3rd Thursday in April for the Spring and the 3rd Thursday in October for the Fall. The above is an example of a rating for a hypothetical grant cycle. The information contained is not derived from any actual grant recipient. Unless you have been advised not to reapply or your project is declined because it does not fall within the guidelines, you may reapply as many times as you wish. A decline does not necessarily mean there is no interest in a project; however choices must be made based on the available funding and other projects submitted for the same grant cycle. There is no restriction to apply again unless your organization received a challenge, conditional or multi-year grant which has not yet been fulfilled (paid). In such a case, organizations should contact the Foundation regarding eligibility. No. There are no limitations on the number of requests. However, you will need to submit a separate proposal for each request. Please do not combine multiple requests in one proposal. The organization does not have to be located in one of the counties (Camden, Glynn, Brantley and Charlton Counties), only if the project requested for will be operated in one of the counties or for residents of those counties. You must be able to show how you will identify and use the funds only for those counties. 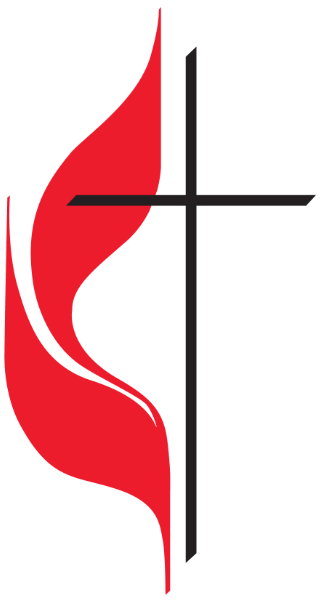 The only other organizations that do not have to be located in the four counties of Southeast Georgia are agencies of the South Georgia Annual Conference of the United Methodist Church and international mission or evangelical organizations whose programs take place outside of the continental United States. No. The Foundation does not consider grant requests for these types of projects. Not typically as the Foundation prefers to fund community focused projects where the collaborative effort of several churches will be more beneficial and effective. For example, a collaboration of churches providing a community-based ministry (i.e. homeless shelters, soup kitchens, after school, etc.) may be eligible if the ministry serves the community rather than individual congregations. Contact the Foundation office, if this is the case, to see if you may be eligible. Our definition of Christian Education is more specific to ministry and pastoral training than general education (i.e. K-12, preschool) in a Christian setting. Any changes that are made will take place at the beginning of a grant cycle (June 1st or December 1st) and will be posted on our website prior to proposal deadlines. No. One of the requirements for an application is to be qualified as an IRS 501(c)(3) charitable organization based in the United States. The foundation has been established to be a lasting charitable resource, and therefore will be awarding grants on an ongoing basis for many years to come. Yes. SMUMC Foundation requires Georgia-based organizations seeking a grant to become a member of the center. For information on joining, visit www.GCN.org/Coastal-Membership.